URA‐AFT members after Saturday’s Legislative conference in East Brunswick. URA members met Saturday, April 16, to participate in union building and planning activities aimed at getting a fair contract and building a stronger union for better working conditions across the university. 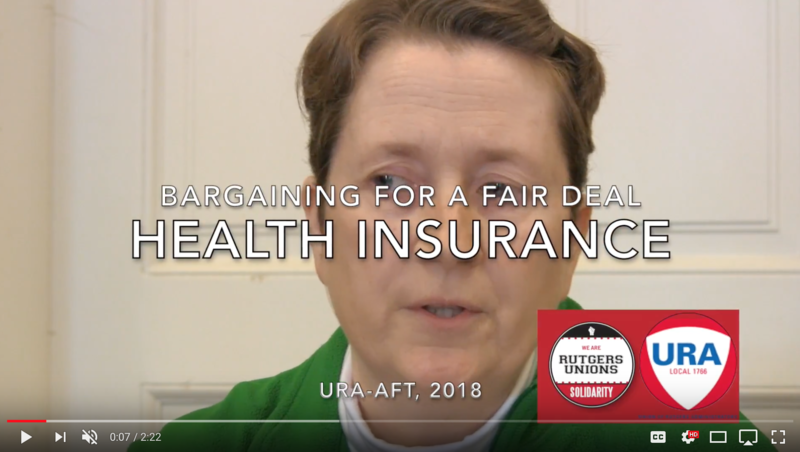 “Our strength is in an active membership who are willing to speak up for equity in pay and demand fair working conditions at Rutgers,” said Christine O’Connell, URA‐AFT President. Where Does Rutgers Money Go? Ask Barchi! Welcome to the Fall Semester at Rutgers. Hopefully you were able to get take a well‐deserved break. Your URA bargaining team has been hard at work this summer and we are scheduled to meet again with management today, September 13. On that note, we are asking that you join us in asking President Barchi “Where does the money go?” Staff, faculty and students will be asking that and other tough questions on Friday, September 21 at the opening meeting for the University Senate. See this flier for additional information and join us in working towards a fair contract for union workers. Check out our Facebook page here to see our members leafleting on the Newark Campus last week. The law mandating increased health insurance costs has sunset, so the percentage of worker contribution is back on the bargaining table. New Jersey workers pay significantly more, on average, than public workers in other states. Click the video (or go to this link https://youtu.be/vmY0JkO2CB8) to see what your co‐workers are saying. Join us at the September 17 membership meeting to talk about bargaining for health insurance.